Now that I have started my new gig at Apple I no longer have the time to investigate and plan super elaborate meals like the Egg Dinner. However having done a bunch of these in the past we decided to make our March dinner a set of Fast Favourites – dishes that we have tried before and do not take too much time to prepare on the day of the meal. So without further ado, lets dive right into the menu. 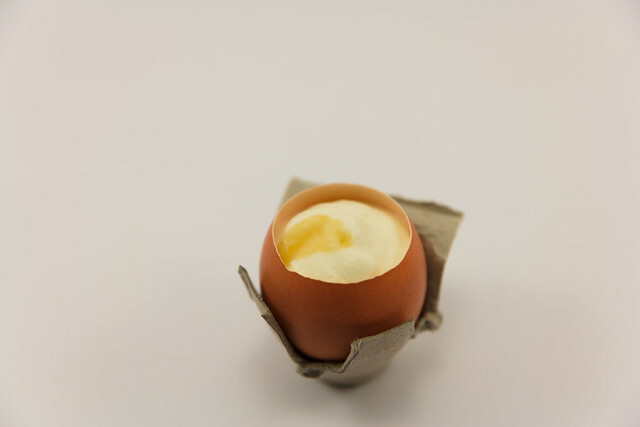 We got started with the classic Manresa Farm Egg. It was a huge amount of work and testing when I made it for the egg dinner, but now that I have a reliable method of topping the eggs I no longer had to prepare the yolks in advance and sanitize the shells overnight. Instead I top the eggs a couple of hours before the meal and just trim any the edges of the membrane off. As long as you keep the shells refrigerated and serve within 4 hours you are good to go. I used the classic recipe from Mind of a Chef and made sure to add a lot more chives (aimed for 99 🙂 ) this time which gave a more bitter taste which enhanced the contrast of the dish. I also warned the diners to dig all the way to the bottom of the egg while eating as you want to ensure you get each layer in every spoonful. Next up is the classic beet spheres with goat cheese which was my very first spherified dish from the tasting at home dinner. Sticking with the fast theme I used store bought beet juice instead of going through the incredible hassle of making the juice from scratch. 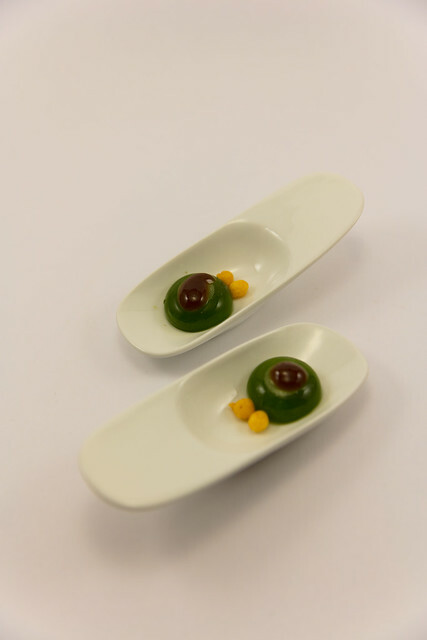 Plus I made a bunch of extra frozen spheres and stored them away in the fridge so that I can make this dish at short notice by just doing a quick spherification bath. 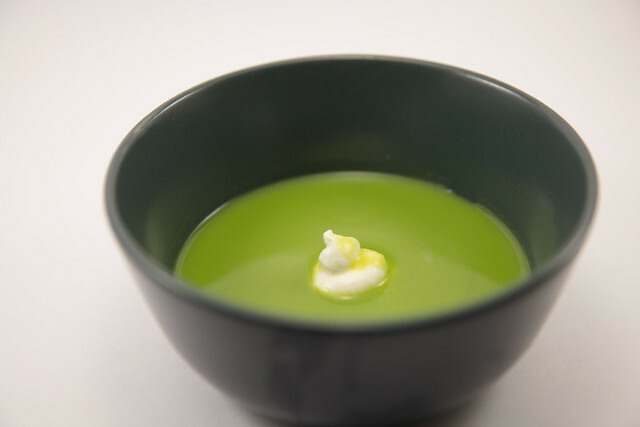 Course 3 was another ChefSteps recipe – pea soup with ricotta. This dish even made using a microwave and takes maybe 30 minutes of total prep before serving. 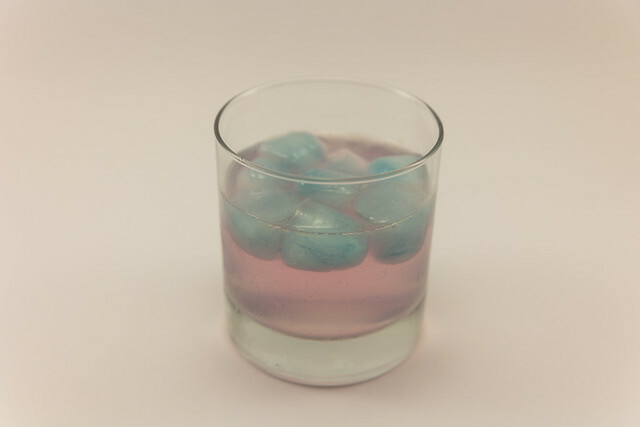 When we made this for tasting at home it was super refreshing but felt like it lacked a little something. This time I doubled the garlic recommendation for the recipe which gave it a nice heat from the garlic which I really liked. Next up was my take on Pani Puri that I first tried for Spheres and Circles. I stuck with exact same recipe as before and once again made an extra set of spheres I have saved away in the freezer for future meals. Next up was a new dish that was inspired by the Ice course at Alinea. 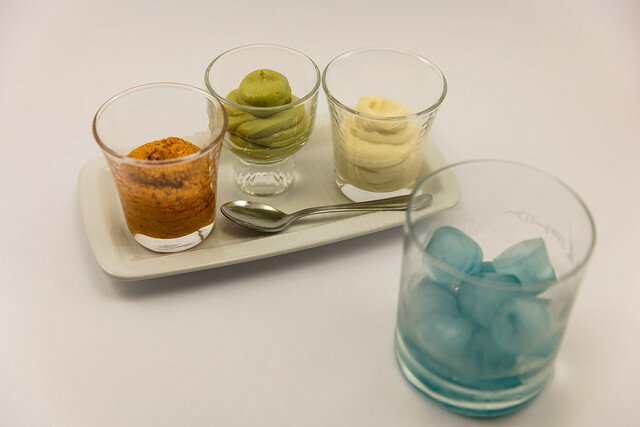 We served a trio of homemade Romesco, Broccoli puree and Cauliflower puree along with strips of toasted brioche. In keeping with the fast theme we pre-prepared all the purees and only had to toast the brioche at the time of serving. Since this was a longer course we served it with the colour changing gin and tonic that we first made in breakfast for dinner. 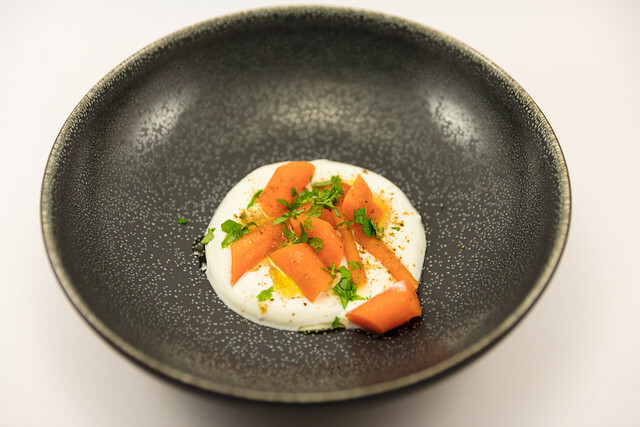 Continuing with fast dishes we had a Yougurt and Carrot salad where the carrots were cooked in the microwave. I really liked the simplicity of this dish and it was a good change of pace before we went into the mains. 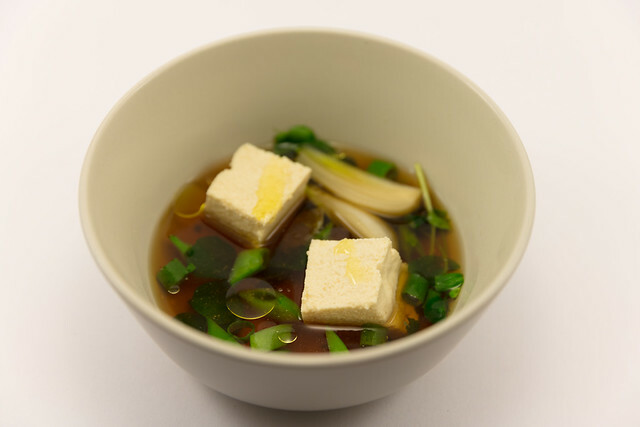 A nice light dish of homemade tofu in an umami filed vegetarian dashi broth. Nithya has been trying to perfect homemade tofu ever since we had tableside tofu at Morimoto in Napa. The tofu for this dish was made during the dinner but since we needed a firmer texture we used a mould in the kitchen to make the blocks. Next time I think we will do the tableside silken tofu as it is a relatively easy dish with minimal effort needed. 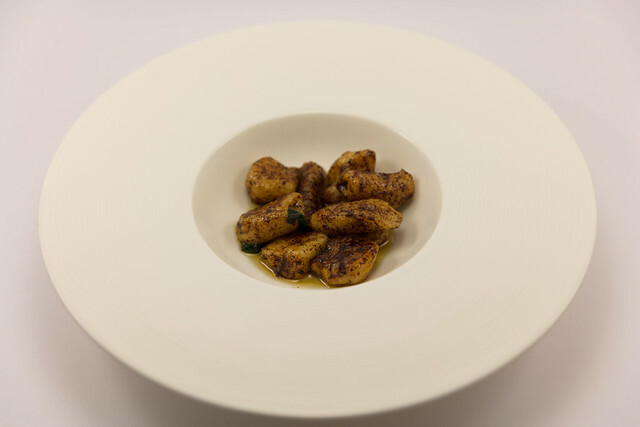 We finish the mains with a nice potato gnocchi with sage and brown butter. We have become big fans of the sage + brown butter treatment after making the gnudi for the Egg Dinner. While I did not particularly like the gnudi texture, the crispy sage in brown butter works very well with gnocchi as well. Bacon and egg dessert was a combination of a few different things I have made in the past. The concept is a continuation of the breakfast for dinner concept with a classic breakfast looking combination changed to be a sweet dessert. 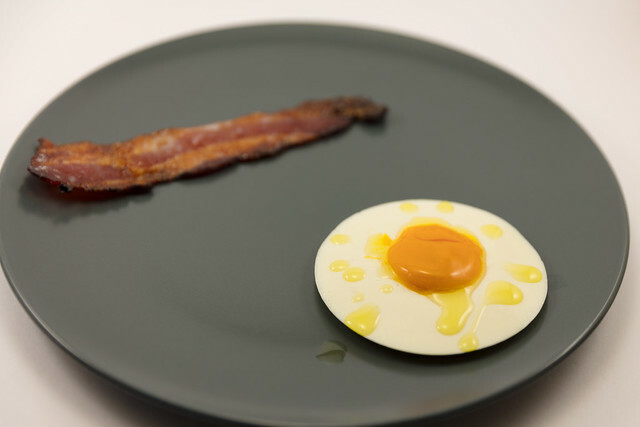 The bacon is candied bacon from the spaghetti carbonara dessert while the egg is similar to eggs benedict dessert but in this case the egg white is made from white chocolate and the yolk is spherified mango puree. The oil was an attempt to make it look fried but that ended up looking pretty shabby on the plate. The next time I will swirl the egg white around the bowl before setting so that it does not look like a perfect circle. I’ll also serve the white flipped over so that the edges dont stand up off the plate. All in all it had good flavours but still needs some work in the plating and execution department. 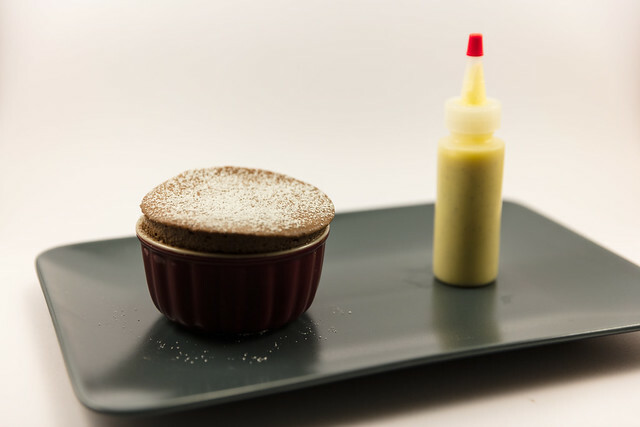 Nithya ended the meal with an excellent chocolate souffle with creme anglaise. All in all it was a good dinner with relatively little work needed during the meal itself which led to a faster meal and should be relatively easy to throw together at short notice. The focus on advance prep meant that very little actual cooking was needed on the day of which is much lower stress. 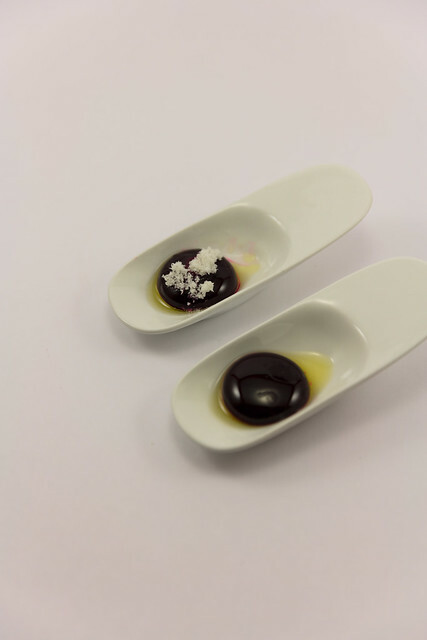 2 of the dishes are even made in the microwave so its a great set of options to make your first multi-course tasting meal at home.